Create better VBA code faster for Microsoft Excel, Access, Word, Outlook and other Office applications. VBA Coding Tools are added to the Visual Basic development environment to create better VBA code faster. 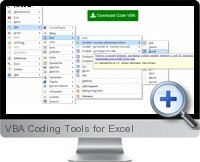 VBA Coding Tools contain a set of 17 specialized code builders supports the fast creation of most used code. The integrated code fragments library lets you find programming solutions easily. Fast declaration of variables and constants. Working with classes, collections and properties. Additional support for Microsoft Access and Microsoft Excel. A collection of 200+ typical VBA code fragments (Microsoft Excel, Microsoft Access, DAO, ADO...) for use with Fragments Builder. Code Line builder: insert VBA and custom procedures. Tab to move through the procedure' s arguments while selecting or adding variables. Fragment builder: lets you use & store fragments of code which you apply many times. Typical fragments would consist of open/read/close on datasets or files, insertion of code change marks, test if file exists, etc. Fragment editor: create new fragments. Insert markers indicating what positions and roles are available and how they are to integrate with the other builders. Procedure builder: Add procedure with arguments including selected type of error handling, header info (author, date, description...), etc. into selected module. Class builder: allows you to create both a class and a corresponding collection class in one go. For example a Task class together with a Tasks collection. The collection includes methods for adding items, class initialization and termination and an 'ItemExists' function. Property builder: Adding properties to classes is rather time consuming. This builder does the obvious things. It is a part of the class builder, but can also be started directly from a class module to add a couple of properties. Variable builder: declare variables without moving from the current position. The variable is added at the top of the procedure, in the procedure's interface or in a selected module. A copy can be pasted at the current position, the place where you actually use it. Insert Variable: lists all variables in scope. Special support is built-in for the Office apps Access and Excel. Excel: Named ranges and typical object references such as ThisWorkbook and ActiveCell. Argument builder: is started from the procedure builder to speed up defining the procedure's arguments. Constant Builder: define constants without moving from the current position. The constant is added in the module you selected, a copy at the current position. A good practice is to have a module where you keep your constants. Using constant builder you don't have to switch modules. Enum builder: using enumerated constants is considered a professional coding practice. It is a practical way to sum up the different cases that need to be considered, typically in a Select Case or For Loop constructions. The builder encourages using this technique. Use 'Add Constant to Enum' item in the Code-VB menu to add new constants. Fast Declare: In most cases when declaring variables, properties or constants you only care about the name and type. E.g. if you select Alt CVS (Code-VB ? Variable ? String) an Input box pops up in which you type the variable name. The result is the same as when you would have selected the variable builder, with all default options.